Port of Philadelphia Import Volume Grew by 21.9% in 2017 - American Supply Co. Thanks to a $300 million expansion effort, business is booming at the Port of Philadelphia, according to a recent article in Supply Chain Dive. After deepening the Delaware River Channel and making substantial infrastructure investments, the port saw import volumes rise by nearly 22% in a single year. This constitutes the largest increase in year-over-year import volumes among any of the top 20 U.S. ports. Descartes Datamyne currently lists the Port of Philadelphia as the 14th-largest port by volume in the nation. Recent improvements to the port include the addition of two 32-story gantry cranes and a substantially-increased refrigerated warehouse capacity. Three more super-post-Panamax cranes are expected to arrive at the port in 2019. Meanwhile, the river deepening project is allowing the port to accommodate “ultra-large” container vessels that were largely limited to West Coast ports until recently. Improvements to the port’s Packer Ave. Terminal were specifically designed to give it the necessary capacity to receive ships from the expanded Panama Canal. 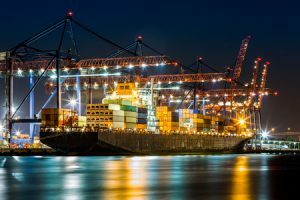 These upgrades will not only allow the Port of Philadelphia to import greater volumes of goods, but also a greater variety of goods from distributors all over the world. Last year, the port experienced a significant uptick in the volume of perishable goods imported from Central America, for example. At American Supply Company, our full-service public bonded warehousing and distribution services are designed to meet the growing needs of businesses in our area that import goods from throughout the United States and abroad. To learn more about our warehouse locations conveniently located near the Port of Philadelphia, give us a call or contact us online today.